The long list of inquiry tools within AutoCAD provide many ways to approach the task of performing quantity takeoffs on your drawings. Yet as powerful as these tools are, one limitation that has long challenged me is way 1 doesn’t always equal 1 in the context of quantity takeoffs. A common example of this is the need to calculate the number of parking stalls throughout a site. Because of site design elements such as parking islands, it’s likely some stalls will not have a painted stripe separating it, meaning it’s not necessarily possible to get an accurate count by simply calculating the number of paint striping lines in my drawing. Despite this limitation, one consistent parameter with parking stalls is their width. It stands to reason that an accurate count could be achieved by adding up the length of a parking stall run, and dividing it by the width of a single stall. Interestingly enough, this can be automated using a lesser known Conversion Factor parameter for Fields. As I make presentations about AutoCAD throughout the year, some of the most common questions that come up have to deal with optimizing AutoCAD; the software is slow to start, the software is very sluggish when I try to draw, and the list goes on. While there’s no one-size-fits-all solution for issues like these, something I’ve found to help more times than not is updating the Autodesk Certified Hardware Database. In some extreme cases I’ve actually seen this solution take an AutoCAD installation that ran so slow and unstable it was absolutely useless, and make it usable once again. 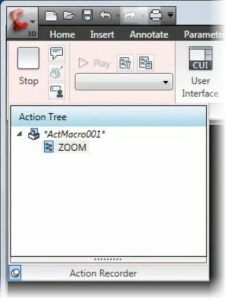 Modern releases of AutoCAD have become much more dependent on your machines graphics card and the underlying drivers. In a nutshell, the Autodesk Certified Hardware Database matches the capabilities of your machines hardware to the capabilities of AutoCAD. AutoCAD provides an almost infinite number of possibilities when preparing a drawing for plotting. Setting up drawing to plot is like an artist making a reproduction of a painting; the two paintings will look very similar, but they’ll never look exactly the same. This is much like plotting in AutoCAD; you’ll probably find the right combination to correctly plot sheet 1, but reproducing those settings for sheet 2 will likely be a shot in the dark. Even if you do manage to perfectly reproduce those settings for subsequent sheets – how much time did you waste? You may have seen a quick tips video I filmed for the AutoCAD Exchange with Heidi Hewett where she and I chatted about a solution to this problem – Named Page Setups. Instead of manually configuring the PLOT command for each drawing you produce, why not capture those settings in a way you can quickly and easily apply them to future sheets? 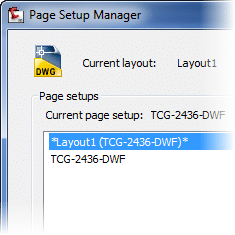 This is the exact role Named Page Setups play in every modern release of AutoCAD. 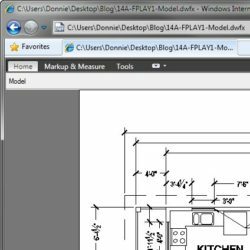 Since I could, and well did write several pages on this topic alone in my upcoming book AutoCAD 2011 and AutoCAD LT 2011: No Experience Required, I’ll give you the Reader’s Digest version in this post. I certainly hope everyone had a wonderful Christmas, and got to spend some quality time with your family. Thanks to a rather historical snow the Saturday before Christmas, here in Richmond, VA we did still have snow on the ground for Christmas. Aside from the big piles of snow found in nearly every parking lot throughout town, by the morning after Christmas all the snowmen had melted away. 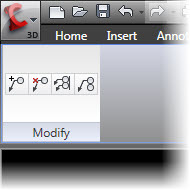 One of my favorite enhancements to AutoCAD 2010 was the contextual ribbon tabs. In fact, contextual tabs are one of the biggest reasons I have come to actually like the Ribbon. 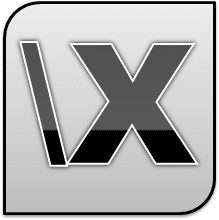 Out of the box Autodesk provides a number of contextual tabs for all sorts of things like xref’s and more. Like many things in AutoCAD, the true power of Contextual Ribbon tabs if the fact you build and customize your own Contextual Ribbon tabs.